Lenco now offers the option of NEMA 1 enclosures with 7 available sizes. 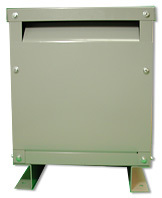 The NEMA 1 enclosures are specifically designed for three phase transformers, however modifications can be made to install single-phase transformers as well. Each enclosure features re-moveable panels and knockout holes to make electrical hook-up a breeze. NEMA 1 enclosures are intended for indoor use primarily to provide a degree of protection against (hand) contact with the enclosed equipment. Sometimes known as a "finger-tight" enclosure. This is the least costly enclosure, but is suitable only for clean, dry environments.